Is your home safe from arson attack? MOMENTS from death, a mum and her baby fled this house just before it exploded in a fire-bomb attack. What can we do to prevent arson attacks from happening? Cambridgeshire Police advise a number of things, but installing a metal box inside the door to catch the mail, is a major consideration. However, Postbox Shop have gone that extra mile, with not just a metal box, but also an anti arson letterbox that extinguishes any sparks, flames or accelerants. 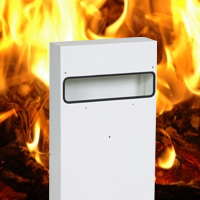 To protect yourself or your business against arson attacks, please install our anti-arson letterboxes on the back of your entrance doors or letter openings. The letterboxes will catch the burning liquid and extinguish the fire. This mailbox is designed to fit neatly behind your door and letter flap. It is fitted with an extinguisher system that operates automatically within seconds of detecting excessive heat, flames or fireworks, protecting your home from arson attacks. Our fireproof letterboxes are constructed from electro-galvanised steel and polyester, powder coated in white, for a tough durable easy to clean finish. These are all for sale with FREE DELIVERY, at an affordable price. Although what price can you put on the safety of your family???!! !